Easy Rawlins is living in 1940’s Los Angeles. A war veteran, he has just been given the sack and, with mortgage payments to meet, he is terrified that he is going lose his house. Then his friend, Joppy, steps in with a suggestion. If Easy helps a man called Mr Albright find a woman called Daphne, Albright will cover Easy’s mortgage payment for the next month. It sounds simple enough and, after an initial foray into the illegal bar scene of Los Angeles, he manages to track Daphne down – or at least can give Mr Albright an address where he can find her. This proves to be just the start, however, and before Easy knows it, he is in the middle of a murder investigation and the theft of a large sum of money, and the police think that he is responsible. Then Daphne explodes into his life and makes it all seem brighter…for a while. Easy is now in trouble with a lot of different people and he needs help. Will someone come along or is he doomed to die at the hands of one of the groups of people he has upset? This is the first in a series of books set in Los Angeles from the 1940s through to the 1960s and has been famously made into a film starring Denzil Washington. Author Walter Mosley is half African-American, half Polish Jewish and, at the time his parents were married, it was strictly against social code for them to be together. Perhaps as a result, Mosley is all too familiar with racial prejudice, and this is very clear in Devil in a Blue Dress. Easy Rawlins is African-American, but is managing to make a successful path for himself despite all the racism surrounding him. He does this by being polite and sincere to everyone, even when they are rude and obnoxious to him. He is reluctant to become involved in Mr Albright’s errand, suspecting that it is going to get him in trouble, but gives in out of desperation. He is a hugely sympathetic character and the reader is immediately behind him – although some of his flaws make him less than perfect. There are a whole other host of characters in the book and, to be honest, it is hard to keep track of them all. This is mainly because they go by their nicknames (Mouse, Joppy, Primo), but partly because there are just so many of them and they are all involved in different ways, yet we don’t really get to know any of them well. The story is narrated by Easy, so we only see the other characters through his eyes, but even when he has known someone for a long time, there is little more than a sentence or two on their past relationship. This doesn’t really make any of them memorable. Perhaps the only ones to play a major part in the book are Daphne, the beautiful white woman that Easy is following, and Mouse, an old partner-in-crime who has the astonishing ability to appear at just the right time. Daphne isn’t a particularly attractive character – she’s described as a beauty, but this is clearly just superficial. Mouse is quite a mysterious, yet strangely likable rogue. They play their part, and I suspect Mouse may appear in future books, but it is really Easy who holds everything together. Although the book was only written in 1990, the book is written very much in the style of Dashiell Hammett and Raymond Chandler; that is, hard-boiled, or noir, detective fiction. Easy isn’t a detective by background, but he shows a number of tendencies towards that path and behaves in the way that any of the masters of noir fiction made their main characters behave. This is a hard genre to break into, but Mosley has done a great job of creating a Los Angeles that is crime-ridden and full of duplicitous characters. The segregation between the races is well described, as is the tough employment situation and the poverty; all in all, the feeling is very depressing, yet intriguing at the same time. Interestingly, the film manages to portray all of this in just the right way, and is possibly the best book to film adaptation I’ve come across in a long time. The writing style, as is often the case with noir detective fiction, is terse and straightforward. At just over 200 pages in my version, there is little opportunity for long-winded descriptions and, apart from a little more information on the characters to make them more memorable, there really wasn’t any need for any more. The terseness makes the story snappy and fast-paced and it is never clear just what is going to happen next. There is little advantage to reading the book in one sitting though. It really does need to be savoured, both for the atmosphere, and to allow the role of the characters to sink in. Despite the fact that this is crime fiction and there are a lot of bodies scattered throughout the book, this isn’t a particularly violent book, so anyone who doesn’t have a taste for gore will be satisfied. Mosley has tried to ensure that the characters speak as they would in their natural environment – that is, in a turn of speech that sometimes takes a bit of concentration to understand: “Sumpin’ wrong?…Naw, ain’t nuthin'”. Having never been to Los Angeles, at certainly not during the time that the book is set, I have no idea how accurate this is. Nevertheless, it sounds accurate and that is the most important thing. And certainly when one of the characters speaks with a French accent, the way that it is transliterated looks just right. Overall, this is a thoroughly enjoyable read that anyone who likes crime fiction will want to add to their to-read list. Those who enjoy hardboiled crime fiction of the Raymond Chandler variety will be even more satisfied. Easy Rawlins is a great invention and Mosley really deserves to be commended for creating him. It is also well worth watching the Denzil Washington film of the same name, although I would strongly recommend reading the book first. I just wish that Mosley had either made the secondary characters a little more memorable or that the publishers had provided a glossary to aid the reader – but that is a minor criticism. Recommended, four stars out of five. 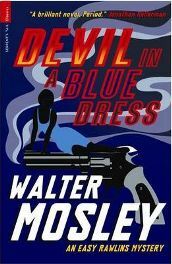 Devil in a Blue Dress by Walter Mosley. Published in Serpent’s Tail Classics edition, May 2010, it has 224 pages. Thanks to Serpent’s Tail for providing a free review copy of the book. No Comments on "Hunting the Devil"